On a bluff overlooking the seaside community of Pismo Beach, the Hilton Garden Inn San Luis Obispo/Pismo Beach is less than 2 miles from outlet shops, golfing, and the Pismo Beach pier. An outdoor pool is provided year-round. 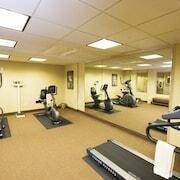 A small 24-hour fitness room has cardio equipment. In addition to a business center with complimentary high-speed Internet access, complimentary wireless Internet access is provided hotel-wide. Overlooking the seaside community of Pismo Beach, the comfortable Hilton Garden Inn San Luis Obispo/Pismo Beach is less than 2 miles from outlet shops, golfing, and the pier; Central Coast wineries stretch 11 to 41 miles away. 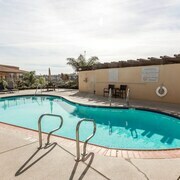 Amenities at Hilton Garden Inn San Luis Obispo/Pismo Beach include an outdoor swimming pool, a 24-hour fitness room with cardio equipment, a business center, and free wireless Internet access. Evoking Mission-style ambience, guestrooms include flat-screen LCD TVs, microwaves, compact refrigerators, bathrooms with granite vanities, and windows that open to fresh air. Hilton Garden Inn San Luis Obispo-Pismo Beach offers 120 air-conditioned accommodations with laptop-compatible safes and safes. LCD televisions come with premium cable channels and pay movies. Guests can make use of the in-room refrigerators, microwaves, and coffee/tea makers. Rooms have partially open bathrooms. Bathrooms include shower/tub combinations, complimentary toiletries, and hair dryers. This Pismo Beach hotel provides complimentary wired and wireless Internet access. Business-friendly amenities include desks and phones; free local calls are provided (restrictions may apply). Housekeeping is provided daily. Great American Grill : Serves a buffet breakfast (surcharge) and a classic menu of American favorites for dinner. Room service is available during dinner hours. Lobby Lounge: Unwind with beer, wine, and evening cocktails in the 4th floor lobby lounge.